Home heating rebates are heating up and Cambridge HVAC Company – Winters Home Services, encourages homeowners to consider upgrading heating equipment while significant Mass Save rebates are available. It's better to plan ahead and replace your aging boiler or furnace, rather than deal with an emergency replacement when you have no heat in the middle of winter. Winters Home Services, an award-winning provider of plumbing, heating, cooling and drain cleaning services to the greater Boston area, is encouraging homeowners with aging natural gas, oil or propane boilers and furnaces to consider replacing old heating equipment while Mass Save sponsoring utilities and energy efficiency service providers are offering significant rebates. Mass Save's Early Heating Equipment Replacement Rebates are back for a limited time. Homeowners may be eligible for generous rebates for replacing inefficient boilers and furnaces (up to $4,000 for replacing a 30+ year-old boiler or up to $1,000 for replacing a 12+ year-old furnace) with more energy efficient heating equipment. "Today's heating systems achieve efficiencies around 98 percent. 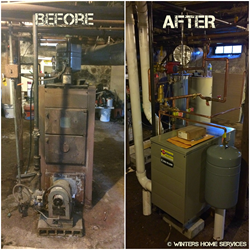 Energy costs are rising, so upgrading to a high-efficiency heating system makes sense and can lower your fuel bill significantly," explained Tim Flynn, owner of Winters Home Services. "It's better to plan ahead and replace your aging boiler or furnace, rather than deal with an emergency replacement when you have no heat in the middle of winter." If a furnace is more than 12 years old and is constantly acting up, or breaking down, then it's time to call a South End furnace replacement company to replace it. Additionally, with age comes the potential for cracks in the heat exchanger inside the furnace, which can leak deadly carbon monoxide. What are some other reasons to replace a furnace or boiler? If the basement has flooded, the heating system will most likely have irreparable damage. Or, if a home has some rooms that are hot while others are cold and the homeowner is constantly adjusting the thermostat to keep the home comfortable. Increasing costs and frequent repairs are a definite sign that a furnace or boiler's days are numbered. Although a 30-year old boiler may still be functioning, homeowners should consider replacing an aged furnace or boiler with a modern, high-efficiency model. A new, energy efficient system will not only perform better, it will ultimately save money on energy bills. Winters Home Services' Master Technicians can provide expert advice and guidance on each system’s energy efficiency rating, output, reliability, warranty and features. They can help homeowners find the best solution for their needs, and provide a free estimate. Winters Home Services urges homeowners to be proactive and have annual inspection and maintenance completed to prolong your new system's lifespan. An out of tune heating system works harder, wastes energy and actually costs more to run. During Winter's comprehensive system tune-up, filters are changed and all is inspected to ensure optimal system performance. Winters Home Services is an award-winning service company based in Cambridge, Massachusetts, specializing in plumbing, heating, cooling, and home monitoring services. Offering the first-to-market CarePlus Home Monitoring Program and lifetime guarantees on many of their services, the company focuses on high quality workmanship and consistent world-class customer service. Winters Home Services promises to fulfill the needs of every customer with a sense of urgency, ensuring comfort, safety and well-being. Winters Home Services is one of the largest residential plumbing companies in the greater Boston-area with a large fleet on the road and a full staff of licensed and insured plumbers and technicians. Tim Flynn, Winter's owner, was recently named a Boston Power Player, helping Boston residents meet their real estate goals. Flynn has shared plumbing, HVAC and home monitoring tips on New England Real Estate Journal (NEREJ) Radio, Boston.com Real Estate Talk Boston and WPLM-FM 99.1. For more information, call 866-482-7586 or visit WintersHomeServices.com.